Get ready for extraordinary raspberry notes coupled with the classic grippy tannins of Sangiovese. This is a varietal that originated in Tuscany and is commonly used to create the region's world famous Chianti blend. In Australia it is fast gaining recognition as a brilliant food wine. Kevin sourced this wine from a single vineyard known for producing exquisite Sangiovese from the Kind Valley, famous for it Italian varieties. The bottle will disappear fast once you've experienced each sip's long, savoury and elegant finish. Made in small quantities, smart Angels will secure their dose of this future Naked classic today before it's all drunk up! Adrian and Rebecca have bottled up a brilliant dose of refreshing fruity flavour for you! This is delicious on your lips and light on your pocket, easy drinking guaranteed. It is a hit with fresh and barbequed seafood, lemon chicken skewers or summer salads. Refreshing and zippy, this light bodied wine is packed with bright flavours of citrus, passionfruit and tropical fruits...an Angel hit every vintage! The latest instalment is no exception, so get in on this incredible value winner today. It is also a scrumptious alternative for those who want to try something other than New Zealand Sauvignon Blanc. 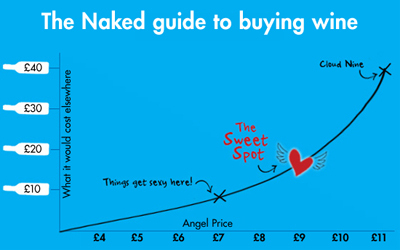 Adrian and Rebecca have brought back this classic Angel favourite! Their latest vintage has floral and apple aromas, leading to juicy pear and spice on the palate. Crisp and fresh on the finish makes it perfect for hot afternoons. Extended contact with grape skins allowed the pink blush colours to infuse into the juice. 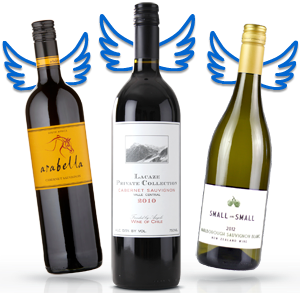 The joy for Angels is evident - interesting textural and savoury elements will bounce around like a party in your mouth! A unique style of Pinot Grigio, this wine is lively and ready to whizz to your door step. A no brainer for your go-to BBQ wine list, it pairs gorgeously with seafood and lighter salad sides. Under $10 a pop for Angels, get this winner in your basket today!